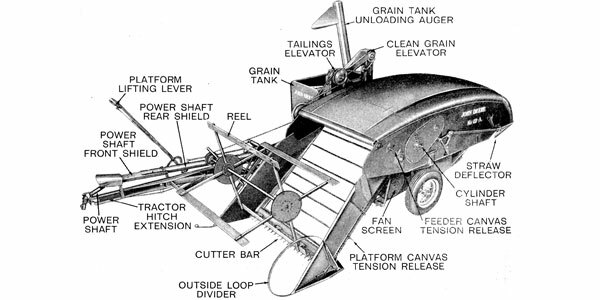 reprinted from Farm Practices by Allis Chalmers Co.
Frame — Correct design very necessary; best materials should be used. Hitch — Must hold gangs securely; must also get quick depth. Gang Bolts — Should be large; durable; self-locking. Bearings & Bushings — Need to be close fitting and made of best quality material. Spacing Spools — Should be milled to fit the disc centers. Scrapers — To be easy on disc blades. Angling Controls — Quick and easy control is essential. Gang Angling — Must be correct for all depths and speeds. Follow Contours — Should be flexible as well as rigid. Discs — Correct concavity; properly treated for long life; extra thickness. Center Control — Should fill dead furrows and level back furrows. Compacting Soil — Correct angle and concavity will do so. Speed — Must be designed for faster tractor travel. Discs today last longer than discs of 20 years ago and testing is done scientifically. Laboratory tests are made first, and then they are put in all field soils to determine their lasting qualities. Disc blades are heat-treated for long life, and seldom, if at all, will they chip while working. The angling of the gangs must conform to the disc concavity for holding penetration at any depth, and the disc concavity must also match speed at which disc harrows can travel and do quality work. At the extreme angle the discs cut a clean furrow with no drag on the backside and with no chattering or jumping — that is, they should do so. If not, then there is either too much or too little angling. The concavity also gives the correct curvature in the ground for steady running when set with the least amount of angle. 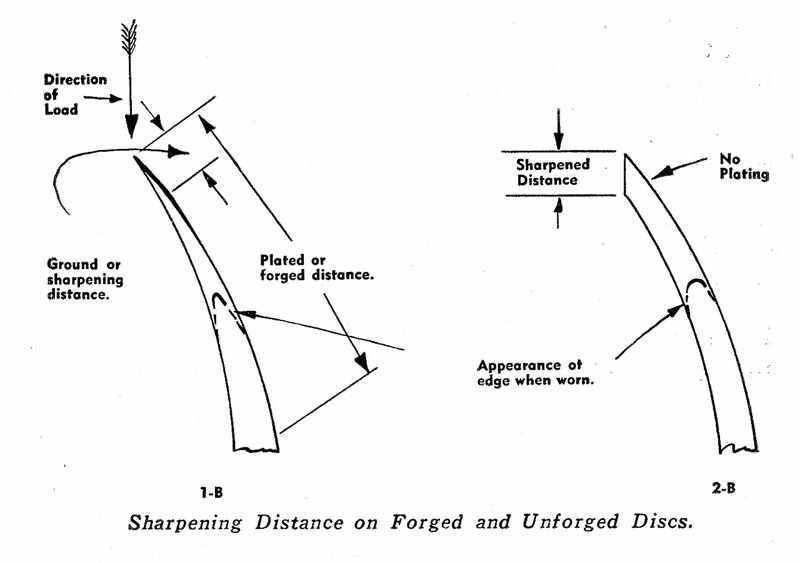 When discs notch the small furrows in washboard fashion working at the minimum angle, it is because the concavity does not follow through with the correct slant against the ground to take a cutting bite. It’s like trying to whittle with a pocketknife set too straight against the wood. With correct concavity, at all angles, and the disc edges set at a pocket knife pitch against the ground for clean cutting, smooth shavings result without jumping and notching the furrows. The correct concavity and angling eliminates the deep furrows. 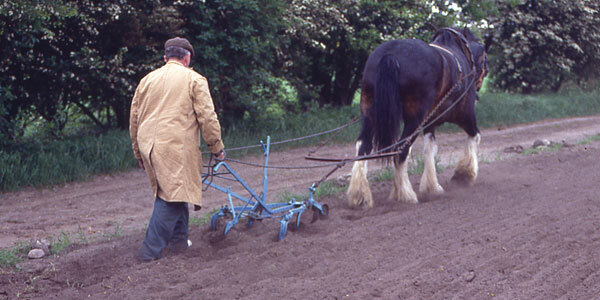 The disc harrow, like the plow, must have a range of varied depths, or it would be of little value. The disc blade is to the harrow what the plow bottom is to the moldboard plow — it is the business or working end of the tool. Frames, bolts, spools, hitch and proper weight are needed and they do their share to cause good cutting. But the actual cutting, lifting and turning of the dirt is effected by the discs, and to do this work the way the users, soils and conditions require it done, demands discs that have correct concavity, made out of the best material, and then properly heat-treated for a lasting and uninterrupted life. The subject of disc concavity — disc curvature in other words — seems to be misunderstood, therefore, it is our purpose to clarify the reasons for the disc concavity so as to set everyone right. But we also want to show that there is a difference in disc concavities, and we also want to show what happens when the different shapes are used. 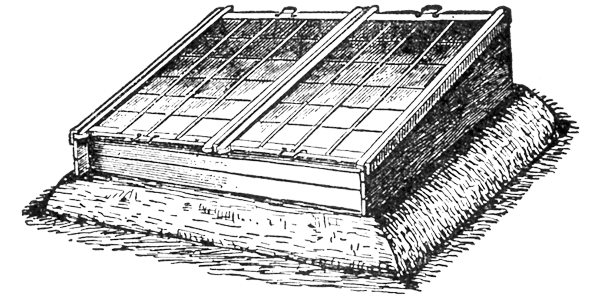 The original harrow was merely a log rolled along to break clods, level surfaces and pack the seedbed to eliminate the air spaces between the turned furrow slice and the furrow sole. It did well as a surface packer and leveler, but it failed to reach down far enough, therefore, its use was limited. Very shortly, from experience in packing dirt around posts, foundations, planting trees and shrubbery by using the spade, discs were conceived — strung on a pole and rolled along — in order to reach down for packing the loose soil nearer the furrow bottom. Tamping with the cutting edge of a spade in loose and lumpy dirt around posts or newly planted trees, packs to the depth of the hole by pulverizing the clods and compacting the pulverized dirt around them in order to eliminate air pockets, and avoids any great amount of settling later on when the dirt takes up moisture. 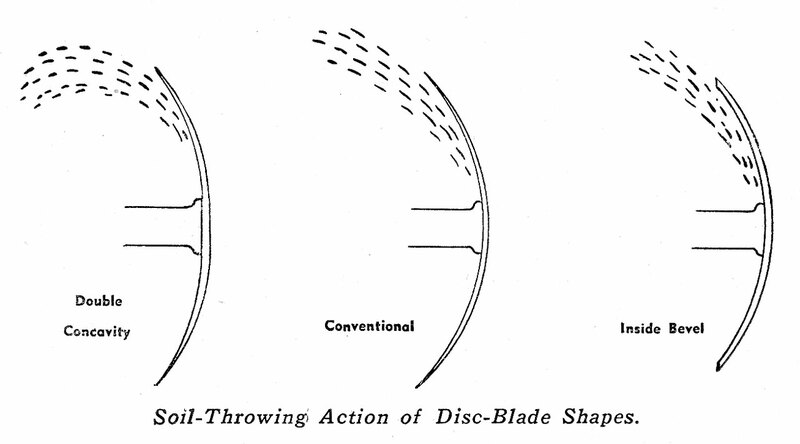 The disc blade, likewise in a loose and lumpy seed bed, pulverizes the clods and compacts the loosened dirt down deep as it rolls along and, therefore, overcomes the dirt settling in spots over the field to effect water holes where clods were not pulverized — a condition often seen when the disc harrow has not been used. The disc harrow is also used for seeding by mounting a hopper over each disc gang. It packs, levels, crushes clods, and drops the seed in the disc trenches. 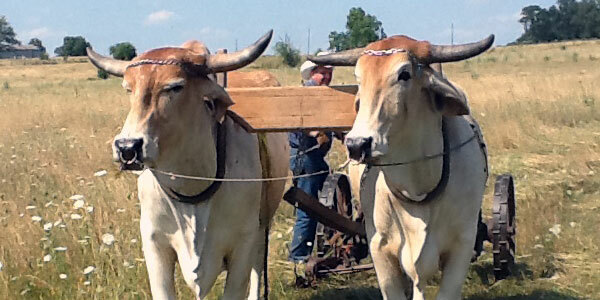 While the disc harrow proved the most versatile tool on the farm, it still presented problems of clogging, wearing quickly, disc breakage, buckling and heavy draft. 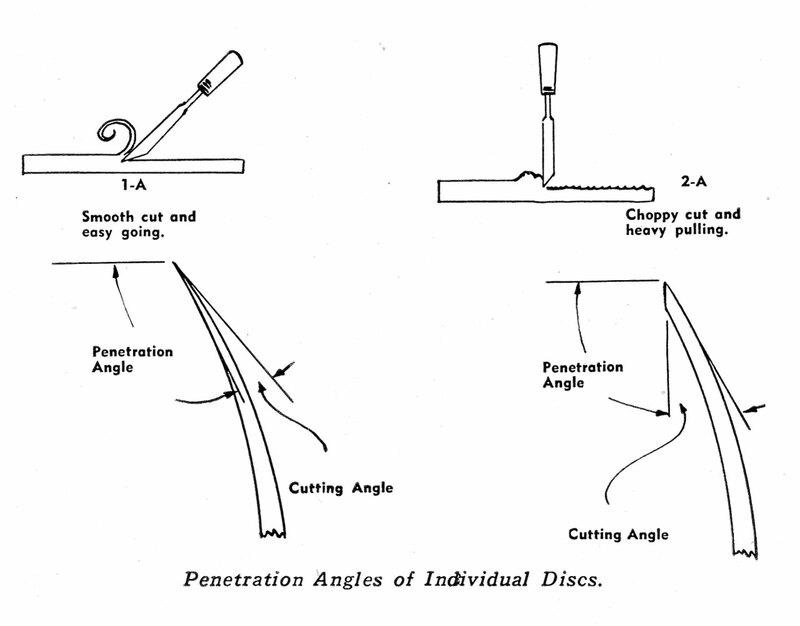 The disc blades were responsible for most of these ills, consequently, much research followed to get proper disc curvature so as to have the best cutting curve for penetration and to lighten the draft. The proper concavity solved these problems, and that’s why correct concavity discs really dig deep when required, pull light and last so much longer. A flat disc blade will cut just as deep as a concave blade if set at a cutting angle, the same as you would tilt a knife blade to cut a clean shaving. The trouble with the flat disc is: no control of the dirt, which merely slides on past to one side — all trash exposed — and more power is required to pull it. The flat disc will also leave deep furrows under the loosened surface and it is more sensitive to varying ground pressures. In hard ground it is jumpy, also true of a disc with too shallow concavity; and in loose ground, like the shallow discs, it digs too deep and pulls hard. Some discs have an inside bevel on the disc cutting edge. That is, instead of grinding or rolling the backside to shape and sharpen, the inside of the edge is turned down. Observe the sketches with notations explaining the difference between the two bevels. It is claimed that this inside bevel affords better cutting of trash and a better bite in hard ground. Only in very loose or sandy soils is the disc harrow used instead of the plow. In hard, heavy, tight and waxy soils the disc harrow may precede the plow to cut up surface growths and trash and break up the top layer, which is later turned under, but it is not going to do a plowing job. Therefore, the deeper digging advantage may be of little use in the field. For roadwork — yes. 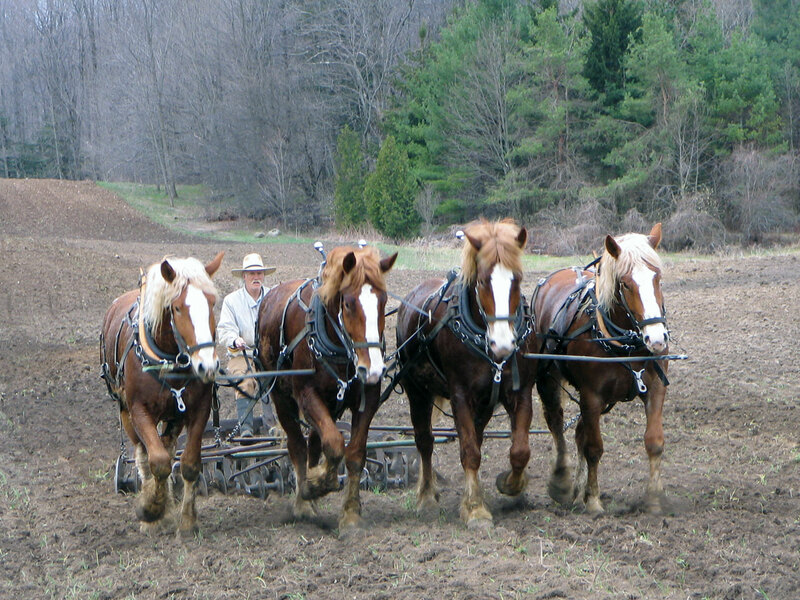 But most of the farm harrows designed for fieldwork are not road harrows. 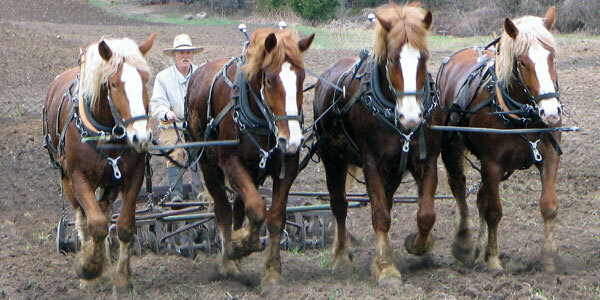 However, heavy regular and offset harrows will dig deep in fairly good plowing fashion. A natural pocket knife slope – inside or backside beveled – is needed for any soil condition. However, in sandy soils, loose and soft soils well filled with organics that break up easily, and abrasive, gravelly soils, any disc will penetrate with ease making it necessary in many instances to add depth bands between the discs to hold the blades to a fixed depth and to keep them from going too deep. A depth roller will control maximum depth of cut. This allows the disc harrow to be set at its full cutting angle, assuring better work. Depth rollers are usually made in two sizes; 10-inch diameter and 12-inch diameter and they weigh about 20 to 25 pounds. Seldom are discs rolled any more to sharpen, because the special rolling equipment to do this particular job is no longer available, and very few blacksmiths are left in the smaller towns or along the roadsides. The average user lets the discs sharpen themselves – others take time to grind them to a knife-edge. With correct concavity the user will have the harrow for many discing seasons and never sharpen the discs, because the bevel and curve are such that, in most soils, a uniform inside and backside wear takes place to bring about a self-sharpening action. But with a too shallow bevel, or a straight down edge, it is like using a flat surface coulter blade, and you can, therefore, well understand why the draft would be extremely heavy when the discs are slightly worn. It is an easy matter to picture just what takes place with some bevels in hybrid corn stubble. If too straight the cutting would compare with the cut of a plow coulter blade which must not be set too deep or there would be no shearing edge. Therefore, its depth is limited if it is necessary to reach down very deep to cut up these tough stalk remnants and roots. 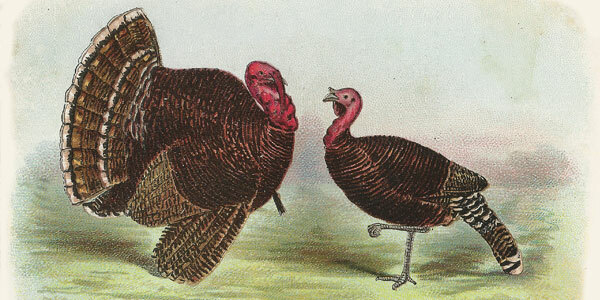 Then, too, the cutting is straight down with a shallow bevel, and the stools, or hills of stubble and roots are merely split and not cut at all, but broken and torn apart. The correct concavity not only cuts smoothly through hard soils, but holds the harrow out in very loose soils. This is due to the curvature, which comes to the correct cutting angle for shearing and for lifting quickly over the inside surface, so that there is no back pressure, and the correct backside curve which acts partly as a gauge in loose soils. To get all that is expected from a disc harrow, the disc curvature must be correct — there must be no guesswork — it must not be too deep and it must not be too shallow. Too much concavity will cause the discs to drag and not roll with the forward motion of the harrow. Shallow concavity speeds up the turning of the gangs. But with the correct disc concavity, and the shorter and more abrupt curvature near the outer edge of the discs, the gangs turn at the correct speed, that is, the required speed is maintained to cause the discs to shed the dirt much better. The quicker pitching results in much better turning of the soil than can be had with either too fast or too slow turning gangs. Too much concavity also interferes with penetration. The backside of the discs will ride the ground and hold gangs out — discs cannot dig and cut. Too little concavity causes the discs to be jumpy, resulting in irregular cutting. Disc curvature must be set for a quick cut, or bite. The curve must also correctly match the weight of the entire harrow. It should match gang angling, speed and hitch to be ideal for scouring and pulverizing. To rebuild and rejuvenate hillside pastures it is desirable, before seeding, to first chisel deep, 18 to 20 inches, and then harrow with the cutaway disc which lifts and loosens sod to receive fertilizer and seed, but not to wholly sever the sod roots from the soil. Pocketing of the sod as shown in the picture will hold rains on sloping pastures – works the planted seed into the sod-root system and loosened soil — holds lime and fertilizers — and naturally holds the water as rains come, causing it to get down into the chisel openings, which in every test so far has resulted in the finest matting of grasses for perfect pastures. The chisel and disc harrow in this case go hand in hand. One definite purpose of cover crops is to improve the soil by working into the soil the many kinds of vegetation that are grown. If green they actually add moisture to the land and they make the soil more springy and loose. Cover crops (vegetation) properly worked in to the soil, help to hold more moisture and they also reduce soil washing. The sticky particles in clay soils are separated, and this makes them easier to work. The air will also flow through the soil much easier and the worked-in cover crops supply food for the following crop. This vegetation should be stirred thoroughly through the soil as deep as practicable and mixed well between the soil grains if it is to do the greatest good and do it quickly. It should not be turned into the soil so deep that it is beyond the reach of the normal feed-root system. Since most field crops normally develop a feed-root system which is comparatively near the surface, it is profitable to enrich the topsoil by thoroughly working into it whatever vegetation is available. It would be ideal if we could mix a cover crop as thoroughly into the land as the baker mixes yeast, flour and other ingredients that go to make up bread and cake, for it is the thoroughness of mixing that makes them uniform and light. To do this job of mixing vegetation with the soil as it should be done, requires a heavy-duty disc harrow having correct size, properly concaved and properly spaced discs. A cover crop disc harrow is not just an ordinary light weight farm harrow — it is a deep digging harrow — strong, well balanced with large diameter discs, as it must go down as deep as 8 inches, sometimes more, to properly stir, cut up and distribute the vegetation as we have explained. Another purpose of the heavy duty cover crop disc harrow is to work down and cut up stalk conditions, especially in hybrid corn stubble fields — to work hard, sun-baked soil — dig and level dead and back furrows and uneven ground-break back and level listed ridges, and to cut up and cover extremely trashy conditions. No other type of disc harrow can meet the requirement for orchard work.